Planning is what I do. 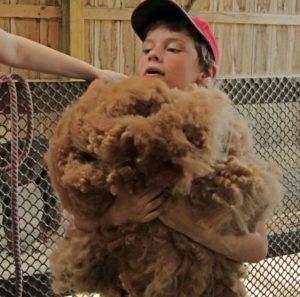 So a day like shearing day – with all its potential chaos – is a day just waiting for me to get my hands all over it. I remember our first shearing day. We purchased our herd in February and brought them to a friend’s farm in the spring. But our barn was still under construction. So our shearing day was held off site, with animals new to us. We were in the skilled and capable hands of a wonderful shearer, Melody MacDonald of Twoloom Alpacas. We had no idea until the day was over how much she knew and how much she managed during the course of the day. Shearing volunteers being briefed before the shearing begins. Shearing day was not just about getting that fibre off our alpacas. It was herd health day. It was training day. It was fibre day. It was volunteer day. It was “photo day”. It was family day. So when shearing day rolled around the following year, I could not help myself. There were people to be managed. There were animals to be handled. There was fun to be had. We needed a plan! Over the years, we have refined that plan, and the lists, and tamed the shear chaos of shearing day turning it into an smooth operation. I won’t say each shearing day goes off without a hitch, but we are focused and we have fun. 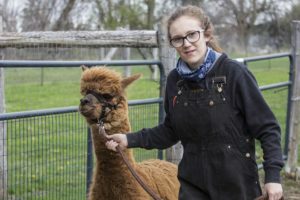 At the end of the day our records are immaculate, our alpacas look elegant, and our volunteers are well-fed, hard-worked, deeply thanked, and sporting smiles along with sweat as they leave the farm. If you are just getting started and wonder what to expect on your first shearing day, make sure your shearing day isn’t your first. 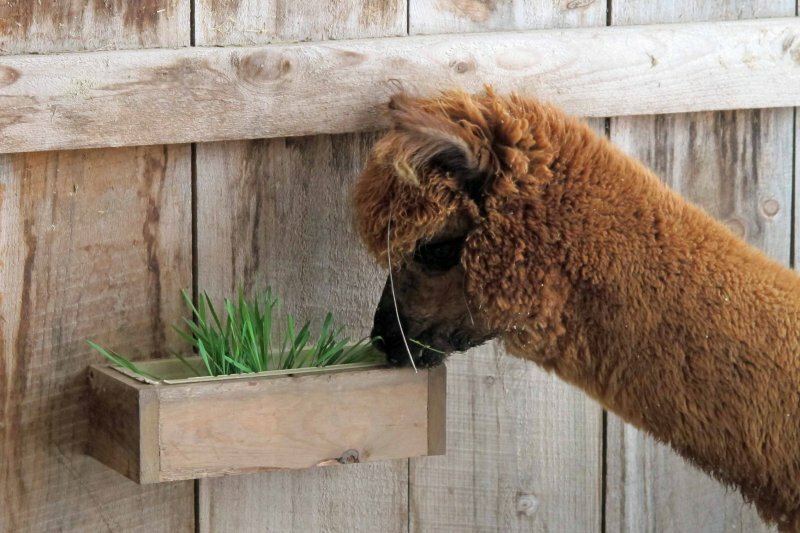 Volunteer at a local alpaca farm on their shearing day. Work with your mentor farm to help them on their big day, and they will share the details every step of the way. So everything you see on shearing day won’t be a first. You will be experienced and prepared with everything you need. We begin planning next year’s shearing day as we wrap up this year’s day. I generally thank our shearer and ask her to book our weekend for the following year. Lock it in. A great shearer is hard to find and they are all busy. So don’t wait. Be on the top of their list. 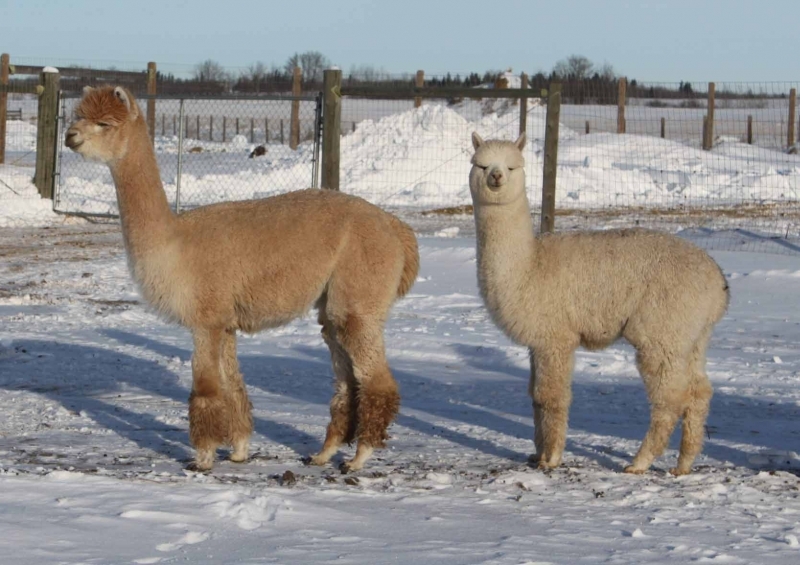 In January, here in Canada, we contact all of our potential volunteers to let them know our shearing date that year. We ask them to “hold the date” in their calendar and confirm with us when they know they can be there. A reminder goes out to them all in a month or two to begin confirming who will be there. Generally, as we have potential clients visit the farm, we extend an invitation to them to join us on shearing day too. Even if they are several years away from starting their farm, they get to see what the busiest day of the year will entail for them. As spring rolls around, my husband starts addressing any maintenance issues that have sprung up over the winter to ensure everything is in good working order for the day. Gates are checked, fences tightened, a little paint here, a little raking and grading there. Things are looking tip top when the volunteers show up for shearing day. Weather is never a sure thing. 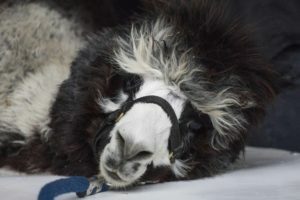 So with that in mind we have a contingency plan for how to handle wet weather, including keeping the alpacas indoors and dry, and creating an indoor shearing area that allows us to carry on despite the weather. Then, we move from weeks to days away. We have our list of volunteers and I begin to plan roles for each. While we like to see people move around during the day and try different things if they want to have a lot of different experiences, the reality is that we need certain hands in certain places. And all roles need to be filled or we can’t get the work done, and safety for both the volunteers and the alpacas is not compromised. So I sit down with a list of roles and begin assigning volunteers to do each task. Record Keeper: think a bookkeeper or accountant who is looking for a weekend adventure! Our record keeper is the ring master of shearing day. She is armed with a clipboard and a “Shearing Record” form for each alpaca (more on that later). 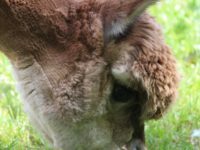 She knows which alpaca is on each shearing table, records all their weights, health issues, any medical procedures or behavioral issues we experience, dosages of vaccines and wormers administered – you name it! 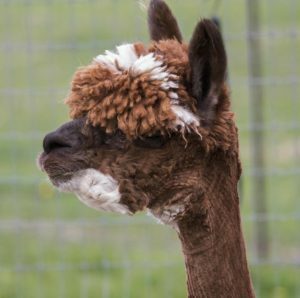 Photographer / Videographer: every alpaca gets a “before” and “after” photo taken on shearing day. 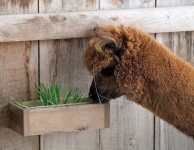 These are really useful photos to have, both to market your alpacas, and to evaluate their features for things like breeding. And video clips taken on shearing day can be useful for training and education. So if you have someone who is good with the camera, set it up on the tripod and ensure that every alpaca runs past them for a photograph on their way in and out. their stalls, taking them outside to be “blown out” using a reversed shop vac. They pick out any vegetation and generally clean them up ready for the shearing table. They weigh them before shearing, take them to have their photo taken and move them to the shearing table. When the alpacas come off the shearing table, these folks weigh them again, take them back for their “after” photo and then return them to their stalls. Runner: here you need a set of young legs that doesn’t mind running from the barn to the house and back to fetch anything that is forgotten and even deliver the message to the kitchen that we will soon be ready for lunch. Food: what is more important than this! When you and your team are ready for a lunch break, you want to get in and out, then back to work. 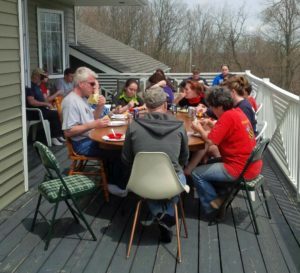 Having food volunteers to do the prep work in the kitchen and have that food on the table ready to go when the volunteers are ready to eat will make all the difference in your day going smoothly. They are also there to put the food away and do clean up so you can head back to the barn with the team and know that everything is handled. We ensure our volunteers are well fed! Vaccine / Wormer Prep & Administration: you don’t need medical experience for this role, but you do need to be comfortable with administering needles. This volunteer gets the required dosage from the record keeper, prepares the needles or drench, administers the medications and then reports back to the record keeper. required. 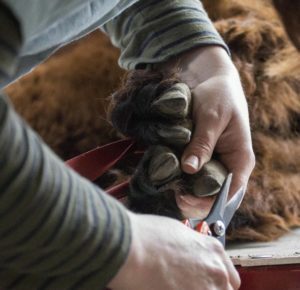 If so, teeth are trimmed by the shearer, and the volunteer gets to work on trimming toes with pruners. 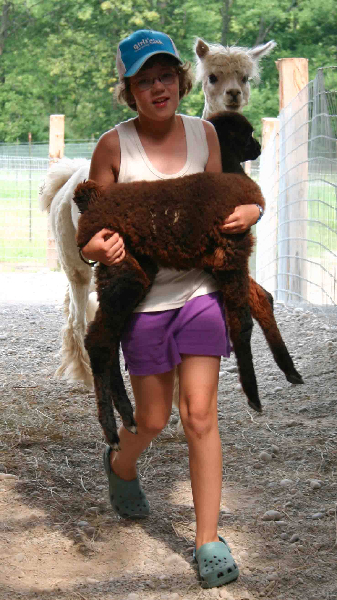 Handler: each shearing station you have on the go should have 3 strong handlers who are comfortable with the alpacas. You will need 2 on the legs, and 1 on the head. They are there to support the shearer and will take their direction from the shearer for each alpaca coming onto the table. 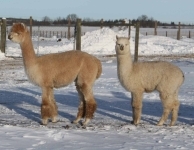 Fleece Grading: this requires a volunteer who is knowledgeable about fibre. 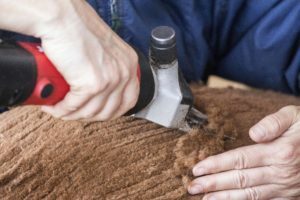 Your shearer may call what grade the fibre is as it is shorn off, but if not, you will need someone on hand to decide what grade it is and have it bagged accordingly. shearing station as the fleece is shorn, but have to work to both stay out of the way of the shearers and handlers, but be close by to catch the fleece as it comes off. 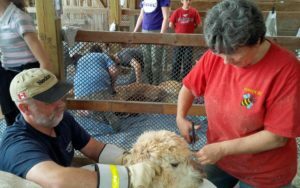 Medic: shearing day is a bit dangerous and accidents to happen. 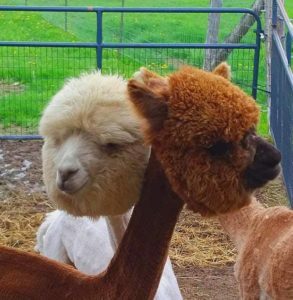 Alpacas can be cut, and so can people. It’s very important to have someone on hand who can stitch, bandage and attend to any animal or person that needs medical attention. Be sure to have all the supplies on hand needed to do both. DJ: yes, it means what you think it means. The barn is full of activity, but we ensure it is full of music too. It makes the day fun and light. And someone has to build the play list for the day. This role falls to our daughter each year. And it sets the tone for the party that is shearing day! That’s the team. I build and plan it well in advance. 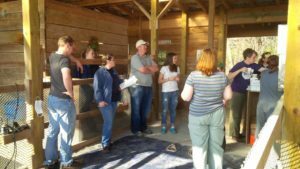 When we begin our shearing day, we have roll call where everyone is assigned their volunteer roll. And then, as the day goes on, they might move around to experience other roles, as long as the team is there to support each task safely. Roll Call Sheet with order of alpacas, dosages, etc. A little top knot trim. If you have hacks or supplies that you use and want to share, please be in touch. We are ready for anything on shearing day. 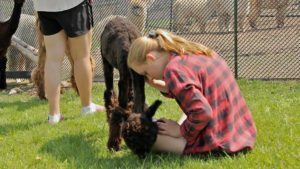 Nothing happens that isn’t recorded so we can do better for both the alpacas and our volunteers each year. Most of all, we take a stressful day and manage it so that it is runs smoothly and is fun. We hope everyone that joins us learns something, experiences a new adventure, and wants to come back next year. It’s 8 a.m. It might be raining, or the sun might be coming up over the hills. The alpacas are humming. The equipment is ready. The team starts to arrive and congregates in the barn, wondering what the day will bring. We take a moment to welcome them, young and old, all with important roles to play. Once we all know each other, and know our roles we take our places. Que the tunes, and let the party begin! Originally published in the March 2018 issue of Camelid Quarterly. A special thanks to the editors for their permission to reprint.